So begins the Diary of Richard Byrd, a Rear Admiral in the United States Navy, a man both admired & honored by his peers as much as he was feared & respected by his enemies. Was Antarctica colonised by Expatriot Germans during the closing stages of World War 2? This is an investigation into allegations surrounding Rear Admiral Richard Evelyn Byrd, Jr. & The expedition to Antarctica during Operation Highjump & the search for the entrance to the Hollow Earth. Various ancient mythologies from Tibet, India, and elsewhere throughout history, allude to technologically advanced civilizations inhabiting a hollow in the Earth. Numerous make believe stories on the subject populate the early 1900s. While some asign this concept to naive ancient philosophies and fantasy, Adolf Hitler and his Third Reich thought it plausible. 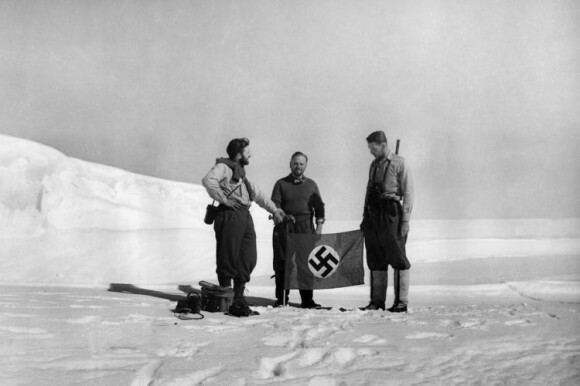 Beginning in 1938, the Nazis launched three separate expeditions to Antarctica. One mission in particular was mobilised specifically to search for the entrance into the Hollow Earth, where Hitler sought to establish bases and enlist the help of its inhabitants for an impending war. Hitler subsequentlyannexed a portion of Antarctica naming it Neu-Schwabenland. Investigators claim that Hitler did in fact build such bases and that he, and thousands of Nazi scientists, escaped to Antarctica after the war. arguably the bravest & stupendous of journeys, inspired by a cultish vision that would set them apart from the rest of the world. German expatritist Deep underground construction teams came pouring into Antarctica, reclaimed & renamed Neu-Schwabenland by the German Nationalist Party & carried with them the Slave Labor needed for the German Antarctica Construction . The intense German war efforts in North and South Africa provided both cover & protecton for the cargo ships bound for the Antarctic Coast while Predator submarines and military ships, preyed upon any ship that even came close to the shipping routes from South Africa to Antarctica & were destroyed by German U-boats to safeguard their secret expedition. Just before the end of World War II two German provision U-boats, U-530 and U-977, were launched from a port on the Baltic Sea following a steady stream of supplies that was carried out throughout the closing stages of the war. Reportedly they took with them members of the antigravity-disc research and development teams carrying Notes, Drawings And Designs For German Flying Discs. The last of the most vital disc components were on these vessels. Much of the technology and hardware that the Allies were looking for concerning the Nazi’s Secret Weapons programme had been transported to the base during the course of the war. This included the notes and drawings for the latest saucer or aerial disc designs and designs for the gigantic underground complexes and living accommodations based on the remarkable underground factories of Nordhausen in the Harz Mountains. The two U-boats duly reached the new land of Neu-Schwabenland where they unloaded everything. When they arrived in Argentina several months later their crews were captured. The shroud of secrecy that surrounds the true nature of Byrd’s expeditions is as thick as the flamboyance of the publicity that supported them from their outset. What is perplexing is that these expeditions were all funded by John D. Rockefella and the United States government. Interestingly, giving creedence to the Hollow Earth Mythos are the numerous first-hand accounts by educated eyewitnesses. In the real-life Antarctic expedition of U.S. 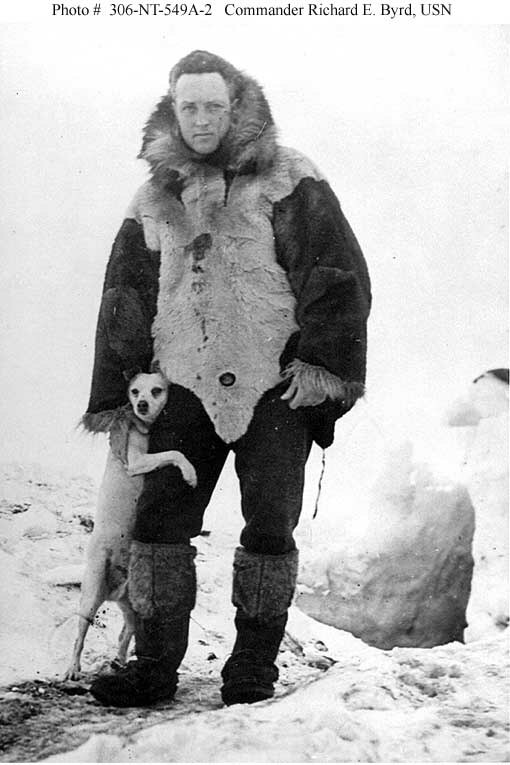 Naval Admiral and Congressional Medal of Honor recipient Richard E. Byrd. 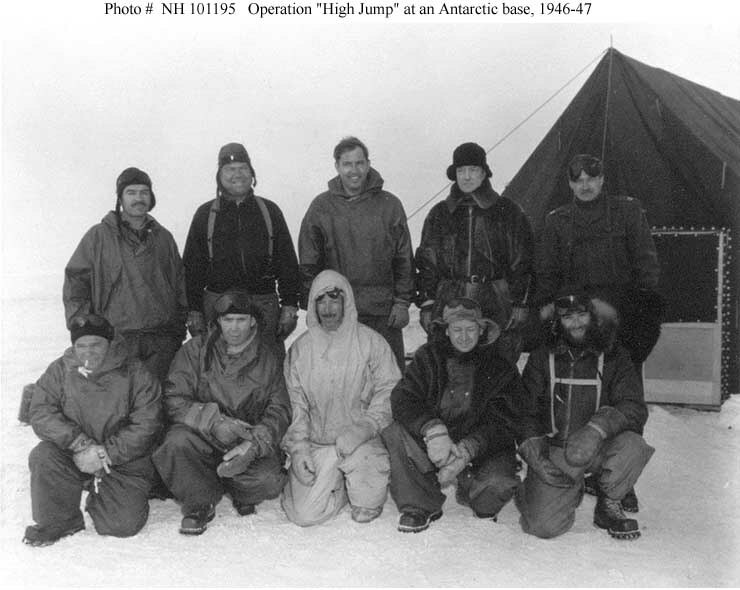 In December of 1946, Admiral Byrd, along with 5,000 fellow sailors, embarked on a massive U.S. Navy reconnaissance mission known as Operation High Jump. An experienced aviator, Byrd flew several reconnaissance missions over the interior of Antarctica. During one such flight in February of 1947, both radar surveillance and radio communication with Byrd’s plane were lost after all other planes had returned to base camp. After three hours, it became obvious that it was impossible for Byrd’s plane to have any remaining fuel. 0915: In the distance is what appears to be mountains. 1000: We are crossing over the small mountain range and still proceeding. Beyond the mountain range is what appears to be a valley with a small stream running through the center portion. There should be no green valley below! 1030: Encountering more green rolling hills now. The external temperature indicator reads 74 degrees Fahrenheit! …Our navigation instruments are still spinning. The gyroscope is oscillating back and forth! The light here seems different. 1130: Ahead we spot what seems to be a city. This is impossible!…off our port and starboard wings are a strange type of aircraft …they are disc shaped and have a radiant quality. A giant “Snow Cruiser” ripped out of a scene from a cliff-hanger serial was commissioned to traverse gaping crevasses and jagged ice ridges became the centre piece of equipment on the Byrd expedition. Byrd in a press conference disclosed plans for the coming expedition explaining he would be taking 6 army tanks and a unique 45,000 pound snow cruiser to be used for transport over the South Pole’s frozen waste. The cruiser was designed by Dr. Thomas C. Pouiter of Chicago, who happened to be the second-in-command of the 1933 Byrd expedition. The odd craft could carry sufficient equipment for an exploring party to last a year. Dr. Pouiter designed the machine to carry a Navy pursuit plane, which by making short flights at 300-mile intervals, could explore about 5,000 square miles of unknown territory in a short Antarctic summer. The snow cruiser … would carry four men and a plane, and would be extremely mobile and easy to manipulate under the difficult conditions found in Antarctica. Energy to power the heavy vehicle would be supplied by two 200-hp diesel engines that would be connected to generators to provide power for driving, communication, electronic stoves, heat and the machine shop. The giant cruiser would be commandeered by one man who would be in the second floor cabin. 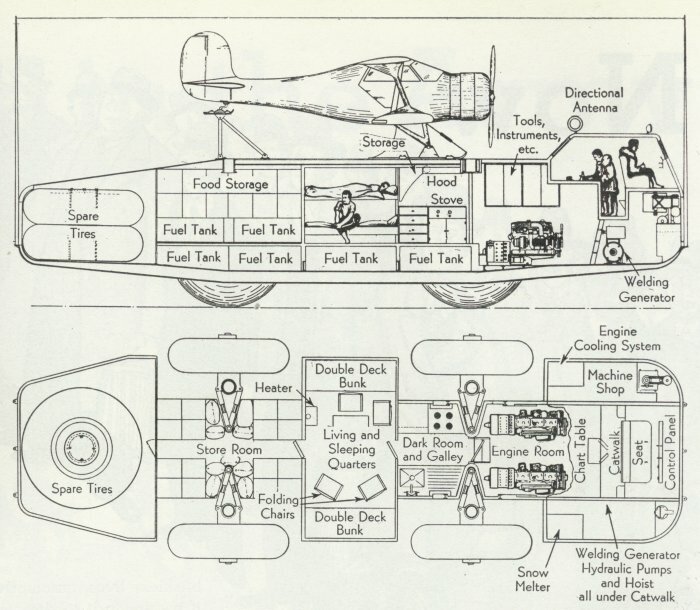 Below this was the repair shop; to the rear, navigation chart desk, galley (which doubled as the photographic lab), bunk-room, storeroom and a compartment in the tail for the two spare tires that were 10 foot in diameter and weighed 1900 pounds each. The cruiser had a 5,000-mile range, and travelled from ten to thirty miles an hour under most conditions except severe blizzards. An automatic gyro-pilot maintained vehicle on any set course. Front and rear wheels steer independently so that the Antarctic bus can turn in a thirty-degree radius or shift sideways at a twenty-five degree angle. The scientists will measure thickness of the ice with the geophysical seismograph, make gravity determinations and meteorological observations, survey unexplored Antarctica and study the Aurora, Terrestrial magnetism, meteors and other phenomena. Cruiser and equipment will cost $150,000. a lot of money in 1939. The Expedition Chief Byrd proposed ice habitation for 5 or 6 Years for verification of the authenticity of their Discoveries and the permanence of their claims. Was the fact that the Germans were also conducting a “secret” expedition in Antarctica make the Admiral’s real reason for putting together the American expedition a matter of up-most importance? Could both expeditions have been conducting secret explorations to the ancient claim by ancient peoples of verdant advanced civilisations beyond and beneath the poles? 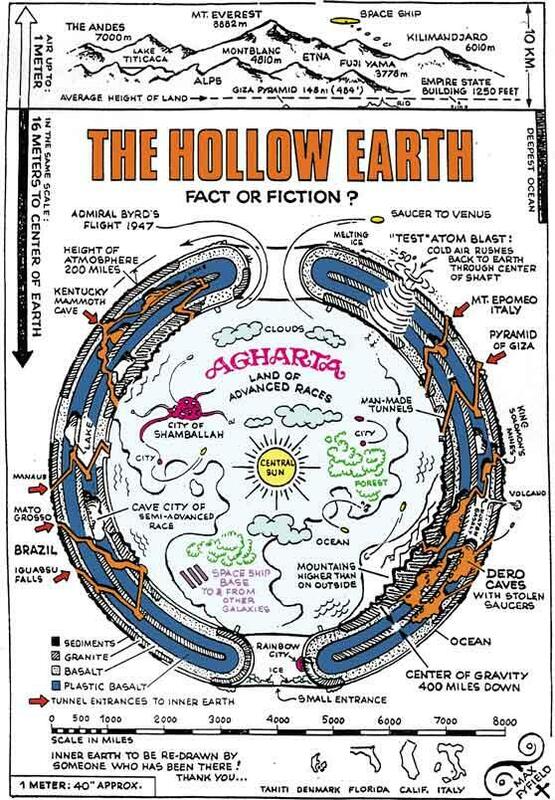 Could the Americans and Germans involved, have been engaged in a race to be the first to gain entrance, and explore the legendary entrance to the Hollow Earth? Could the Americans and Germans in 1939 been in a race, not unlike the ‘space race’ between America and Russia today. Could they have been lead to believe that Antarctica wasn’t a frozen, barren wasteland? That it was more conducive to life than the day’s discoveries allowed. Could Antarctica harbour an entrance into a habitable world populated by thought-to-be extinct huge wild animals and reptiles, and even more dangerous, creatures of intelligence equal or greater than ours as Byrd’s incredible Diary postulates?